The city of Auburn has earned the reputation of being the Endurance Capital of the World hosting epic events testing the endurance of athletes from all over the world. 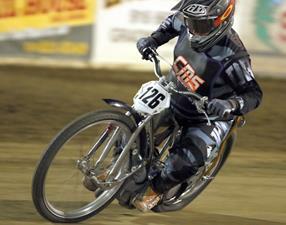 Friday night Fast Fridays Motorcycle Speedway at the Gold Country Fairgrounds staged their own version of motorcycle endurance with a 25 lap handicap main event testing everything a rider can give and living up Auburn’s well earned reputation. Make the race more than four times longer than a regular handicap race and double the handicaps distances and you have a real test of rider endurance and skill. 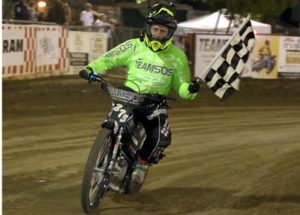 Twenty-six year old Russell Green proved that maybe youth does have an advantage in certain physical arenas when he muscled his way to the top winning the special 25 lap handicap main event and becoming this year’s Fast Fridays Ironman. Twelve riders found their way to their new handicaps, double the regular distances for the start. Green started on the 80 yard line. Many riders started with deep handicaps including national champion Billy Janniro taking his place on the 140 yard line. The gate went up, the dust began to fly and race officials began the daunting task of counting laps. Green took the lead after five laps and marked with a target on his back was hunted by everyone. Bart Bast and Tommy Hedden gave chase for some time then moving up steadily Janniro was soon just behind Bast in the hunt and the three were in a dogfight, followed by three more riders further back. Janniro, closing in on Green, took a fall with just two laps to go and Green continued to steadily ride, making no mistakes, to hold on to the lead and the win. Bast was second and Ryan Bast was third. 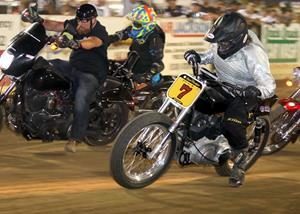 Billy Janniro came back with another win in the scratch main event, repeating his performance last week. The win gives Janniro six scratch main events wins this season losing only two scratch main events this season both to Bart Bast. On a track prepared the way he likes it, Janniro worked the outside of the track to keep ahead of Tommy Hedden and Bart Bast who choose the smoother inside track. Digging the deep dirt Janniro had little trouble taking the checkered flag. Hedden was second, Bast third and Ryan Bast was fourth. Sammy Tetrault continues his winning streak in Division II winning his second main event in a row. Since leaving the youth ranks just last season, Tetrault has three main event wins in Division II and Division III and has yet to finish below third place in either division all season long. Making a fast climb in divisions Tetrault now will be on the 30 yard line. He is seriously now the man to beat in DII, and look for this young rider to continue his way to division I. Matt King was second and Charlie Haines third. Jake Estes picked up his first main event win of the season with a win in Division III. Estes has been knocking on the door with a couple of second place finishes putting it together Friday night off the 10 yard line for the win. Jeff Powell was second and Peter Pecorilla was third. 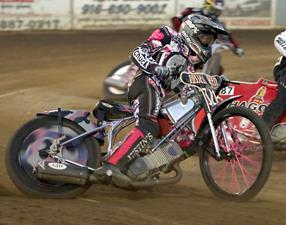 Continuing his winning ways Auburn’s Cameron Krezman won his third Youth 250cc main event in a row and his fifth for the season. Landon Norton was second and Greg Moore was third. 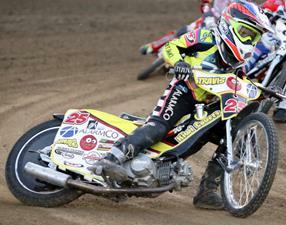 Krezman and Norton have been competitors this season with one or the other taking first in the Youth 250cc division. 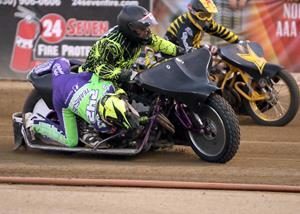 Making his trips from Southern California work the mileage, Travis Horn picked up his second Youth 150cc championship in two weeks. Horn had a second and a first place finish in his heat races then the win in the main. Colton Nelson was second and Charlie Trana was third. 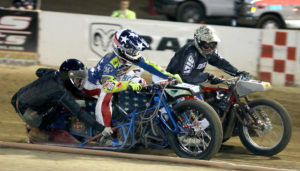 Friday night the Extreme Sidecar teams make their way back to Fast Fridays for the third round of their four season appearances in Auburn. Be sure not to miss their unique and exciting brand of three wheel racing. -Billy Janniro gets off to a start in the scratch main event which Janniro won for the second week in a row. 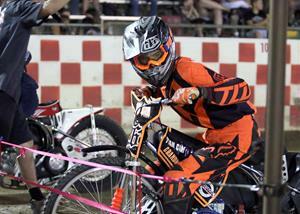 Cameron Krezman gets set on the start line in the Youth 250cc main event. Krezman has won three main events in a row. 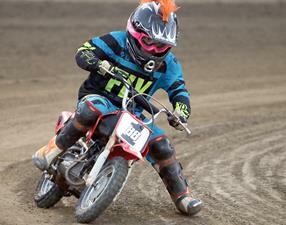 Auburn’s Colton Arbogast races in the popular Pee-Wee division. Jake Estes won his first Division III main event of the season. 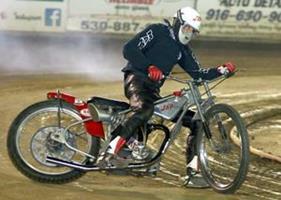 Russell Green was Fast Fridays Ironman winning the special 25 lap handicap main event. 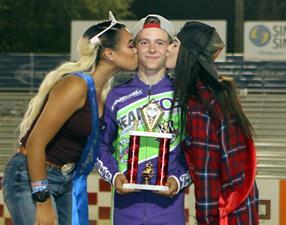 Sammy Tetrault gets congratulating kisses for the Fast Friday’s trophy girls after his Division II main event win Friday. 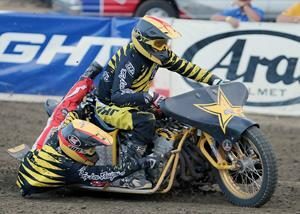 Southern California’s Travis Horn made the journey north and has won two Youth 150cc main events in a row, including last weeks.